Let’s be honest. There’s really no such thing as a pretty bowl of vegetable beef soup. It just looks like mushy brown soup with over cooked vegetables. But, I can’t even tell you how much my family loves vegetable beef soup. I have been sick, non-stop, since Thanksgiving. Please don’t feel sorry for me. This is the story of my life. I get every illness that walks into my kindergarten classroom and it’s been that way for my 22 years of teaching. It’s just the way things go. 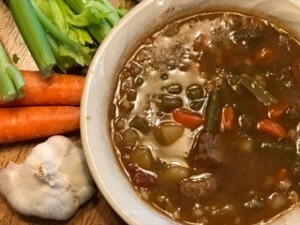 This vegetable beef soup recipe is my go-to when I need a little pick-me-up and feel like I need to eat ALL of the vegetables NOW. My kids aren’t horribly picky eaters. My son will eat anything you put in front of him. My daughter usually tries new things but then falls back on chicken nuggets. 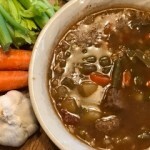 But, vegetable beef soup is the one thing they will gobble up and go back for seconds. They LOVE this stuff! Enjoy! Heat the olive oil in the pan. Brown the beef and then add garlic and onion. Cook until onions are softened. Add the diced, celery, carrots, potatoes, and tomatoes. Add the bag of frozen green beans and beef stock. Let simmer for several hours. Add barley at the end of cooking and cook according to package directions. The brand I use says to add the barley during the last hour of cooking.